The deadly threat posed by armed groups in the Central African Republic has led to severe displacement and food insecurity. In this excerpt from our Watch List 2019 for European policy makers, Crisis Group urges the EU to support multi-level mediation by the African Union and to back local peace initiatives. More than six years after the beginning of the Central African Republic's (CAR) most important crisis since the country's independence and three years after President Faustin Archange Touadéra's election, the country remains in turmoil. 2018 ended with lethal clashes both between armed groups and between them and UN peacekeepers in major towns and rising tensions in the capital Bangui. Former factions of the Seleka, a coalition of rebel groups from the country's north and east which in 2013 overthrew then President François Bozizé and held power for two years before being ousted, the anti-balaka, militias formed to fight the Seleka which then turned into bandits, and a series of other community self-defence militias hold sway across much of the country, controlling many mining sites, transport routes and pastoralists' transmigration corridors. Neither the large UN peacekeeping force, the UN Multidimensional Integrated Stabilization Mission in the Central African Republic (MINUSCA) nor the fledgling national army, which is slowly deploying across the country following years of EU training, can constrain these groups' infighting and predation. The violence is driving severe displacement, food insecurity and malnutrition. According to the UN Office for the Coordination of Humanitarian Affairs' October 2018 figures, there are currently 642,842 internally displaced and over 573,200, many of them Muslims fleeing persecution by various militias, seeking refuge in neighbouring countries. Some 2.5 million people need humanitarian aid. Most of the Muslims remaining in the capital, concentrated in the PK5 district, still live in fear of cycles of revenge violence among armed gangs that use religious belonging as an identifier and pretext for abuses. As of late January (as this Watch List went to print), representatives of the different armed groups and the government were holding talks in the Sudanese capital Khartoum. 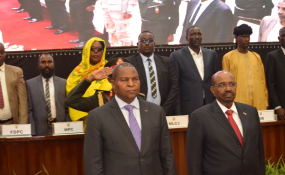 These talks present a welcome opportunity to refocus regional efforts on the African Union (AU)-led mediation, which have recently been in unhelpful competition with a parallel Russian-Sudanese initiative. Some form of agreement appears likely to emerge from the Khartoum meeting, though will require compromise from both sides. The challenge for 2019 will be to ensure that such an agreement makes a concrete difference on the ground. It will be important for international actors to present a united front and pressure neighbouring countries, particularly Sudan and Chad, to use their influence over armed groups - notably the largest ex-Seleka factions - to ensure they fulfil any pledges made in Khartoum. They should also support local peace initiatives, during which armed groups' demands can be taken into account alongside the concerns of local communities in which they operate, as a complement to the national-level agreement. Alongside the UN, step up support for local peace initiatives that factor in armed groups' local demands and the concerns of local communities, and thus both diminish levels of violence and allow for a finer-grained understanding of armed groups' interests and strengths, and improving prospects for their disarmament. Since June 2017, the AU, backed by African countries and the UN as well as the EU and its member states, has tried to mediate between the government and fourteen armed groups including ex-Seleka factions, anti-balaka groups and community self-defence militias, which in many cases have competing sets of interests and goals. The AU Mediation Panel of Facilitation, led by Burkina Faso's Moussa Nébié, has met those groups' leaders in preparation for dialogue with the government, resulting in a list of 115 different demands grouped into four thematic areas (politics, socio-economy, security and defence, justice and reconciliation). Key demands likely to be obstacles in negotiations centre around devolution (which the government fears armed groups would use to consolidate their grip on provinces they control, particularly in the case of the large ex-Seleka factions in the north and east of the country ); national-level power sharing; control over natural resources; the armed groups' demands for immunity for crimes committed during the conflict; and the integration of some of their members into the army, including at what rank. Over the past few months, Nébié's AU-led efforts had been undercut by a parallel Russian-Sudanese initiative. At the end of 2017, President Faustin-Archange Touadéra, frustrated by the perceived inefficiency or slowness of his partners to help deploy the national army and bring armed groups to the negotiating table, had sought Russian help. Moscow provided the national army with training and equipment following that already delivered by the EU Training Mission active in CAR since 2016. Russia also started to provide the president with security advice and personal protection. In mid-2018, it encouraged Sudan, with which Moscow has increasingly close relations, to initiate its own talks in Khartoum with armed groups and government representatives. Until recently, this parallel track had sucked oxygen from the AU's efforts and allowed both armed groups and government representatives to forum-shop. It also provoked tensions between on the one hand the AU, the UN and the EU, which supported the AU track, and on the other Sudan, Russia and President Touadéra. Talks may still be tricky, however. The government has agreed to integrate some armed group members into the armed forces, while adhering to the age and education requirements already in place. But government negotiators are likely to resist ceding more ground on power sharing and immunity, given popular anger at the armed groups' predation and violence and the fact that the concessions those groups have won in the past have not led them to change their behaviour. Unless they face pressure from their allies, armed groups' leaders may camp on their maximalist demands. Probably the best that can reasonably be expected from Khartoum is a broad agreement on the ranks at which a limited number of armed group members could enter the army and for some rebels who disarm to be granted mid-level public offices, in exchange for a ceasefire and an agreement from armed groups that they will demobilise. The main risk is less that the Khartoum talks fail to reach an accord along these lines than that its provisions are not enforced. Many previous deals between government and armed groups have not brought concrete changes on the ground. Throughout 2018, some smaller armed groups expressed a willingness to disarm, but stalled doing so in anticipation of better terms emerging from an agreement in Khartoum. Following this round of talks, President Touadéra's government and international partners, especially the UN, need to seize the opportunity of whatever is agreed to advance efforts to demobilise armed groups as much as possible. CAR's neighbours ought to lend their support to ensure that armed groups fulfil any commitments made in Khartoum. Some ex-Seleka factions in particular have close links to neighbouring governments, notably those of Chad and Sudan; indeed many combatants and armed herders that seek pastoral land hail from those countries. N'Djamena and Khartoum have an interest in their southern neighbour's stability. But they balance that against the interests of their pastoralist and trading communities or allied armed groups in border areas. Talks are needed between Bangui and both Khartoum and N'Djamena aimed at reaching agreement on security guarantees for all sides and on modalities for repatriating Chadians and Sudanese currently fighting with armed groups in CAR. African and EU governments, as well as Russia, should offer support to such talks. Also important is that local mediation efforts complement those at national level. The armed groups in CAR vary significantly in strength, geographical reach, motivations and relations with their communities. Of the fourteen represented in Khartoum only three, all ex-Seleka groups, have significant national and cross-border reach. The anti-balaka groups in particular are fragmented and some have ties to the government with which they are in principle negotiating. Most groups' main concerns are local, often revolving around control of resources in areas they control. Moreover, a patchwork of other groups were not represented in Khartoum, but still need to be demobilised.